What Is the Difference Between a Wave Runner & a Jet Ski? 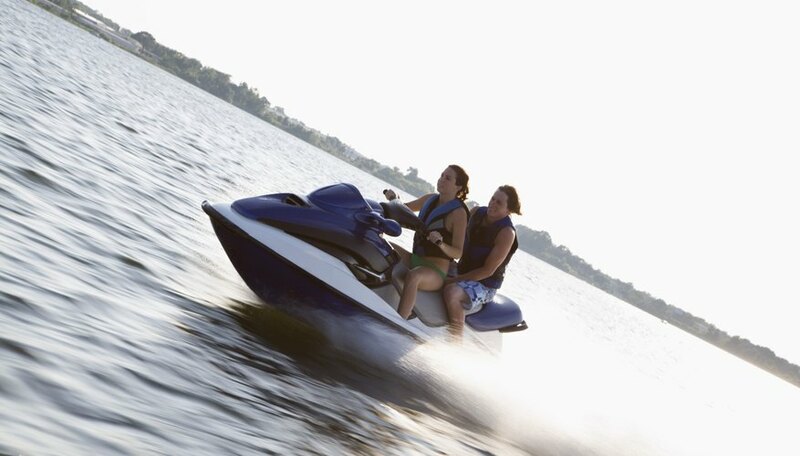 Both wave runners and jet skis are personal watercraft vehicles or PWCs. These machines are a hybrid between a water ski, power jet boat and a motorcycle and offer a fast and thrilling water experience. While the terms "wave runner" and "jet ski" have been used interchangeably, the brand WaveRunner is a type of PWC made by Yamaha while Kawasaki makes Jet Ski. Both companies make many different models of personal watercraft that offer consumers the opportunity to ride standing, sitting, alone or with passengers. When Kawasaki developed the Jet Ski in the 1970s, these early models were made to be ridden standing up; Yamaha designed the WaveRunner to be ridden while seated. This is no longer true as of 2011. Different models offer different options. The 2011 Yamaha WaveRunner SuperJet model, for example, is made to be ridden from a standing position while the 2011 Kawasaki STX Jet Ski has three seats. The 2011 WaveRunner Superjet is built for one person only while the Kawasaki STX Jet Ski is well suited to two people. The 2011 Kawasaki STX Jet Ski is more expensive than the 2011 Yamaha WaveRunner Superjet, but the Kawasaki STX Jet Ski offers conveniences not offered by its less expensive counterpart. The Kawasaki STX Jet Ski is priced as of this writing at around $8,500 while the 2011 Yamaha WaveRunner Superjet is priced at $7,900. The Kawasaki STX Jet Ski offers a digital panel including a clock, tachometer, trip odometer, speedometer and hour meter. There is no digital panel on the Yamaha WaveRunner Superjet. The 2011 Yamaha WaveRunner Superjet only holds 4.8 gallons of gas/oil pre-mixture while the 2011 Kawasaki STX Jet Ski holds 16.4 gallons of gas. The 2011 Kawasaki STX Jet Ski offers storage capacity under the seat, in the glove box and in the dashboard while there is no storage capacity in the 2011 Yamaha WaveRunner Superjet. Making a choice between a Yamaha WaveRunner and a Kawasaki Jet Ski is a personal decision, based on your own brand loyalties, the price you can obtain and the conveniences offered with the models available to you. If price is your main consideration, the 2011 Yamaha WaveRunner Superjet is approximately $600 less than the 2011 Kawasaki STX Jet Ski, especially if you are looking for a basic model to ride alone and are not impressed by the conveniences offered by the STX Jet Ski. If, however, you are more motivated by convenience features such as larger gas capacity, storage options and digital panels, then the STX Jet Ski may be the right option for you. If you are looking to bring friends, or loved-ones along on your ride, the 2011 WaveRunner Superjet will not accommodate them with you, although you can take turns riding it individually whereas the 2011 STX Jet Ski will let you take passengers along for the ride. Can Xfinity TV Be Watched on a PS3?